OKLAHOMA CITY (Feb. 10, 2017) – Kristy Ehlers remembers it as one of El Reno Public Schools’ greatest crises – the month that four deaths stunned the community and left students and staff heartbroken. In March 2014, a collision on icy roads killed two teenagers, a second car accident took the life of a teacher and another teacher’s spouse died in a gun-cleaning accident. Grappling with multiple tragedies in such a short time and knowing how to re-stabilize life for its students led El Reno to develop a crisis plan, something the district is sharing with other schools at crisis team trainings across the state this February. More than 900 educators from 200 districts have registered so far for the one-day trainings. Demand has been so high, the Oklahoma State Department of Education (OSDE) doubled the initial number of sessions offered. The free trainings, the first of their kind in the state, are sponsored by the OSDE and Oklahoma School Security Institute with support from the Oklahoma Department of Mental Health. Career Tech sites around the state are hosting the conferences at no charge to OSDE or attendees. This will be the first crisis team training for about 70 percent of the attendees. According to Sutherlin, current crisis preparation for most schools is limited to critical incident guides – bulleted flip charts with basic response information. Of the schools that do have crisis teams, only 19 percent meet regularly. The OSDE trainings will help schools develop detailed crisis plans that outline specific roles, responsibilities and procedures for any type of crisis, including natural disasters or deaths of student or faculty members. “School is so much more than learning in a classroom. Students have to be safe and secure. They have to have their social and emotional needs met. We know when those things are not occurring, it makes it impossible to learn,” Sutherlin said. 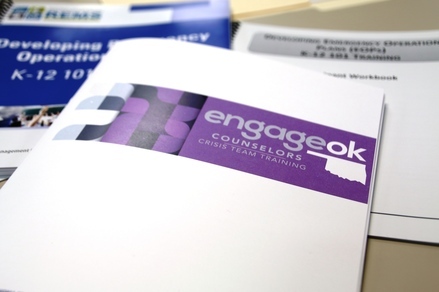 El Reno’s crisis team is a diverse group of counselors, administrators, central office staff, teachers and community members who meet quarterly to review the plan based on the Lifelines curriculum, customized to fit the district’s needs. It includes checklists, sample scripts, press releases and suggested activities to help students cope with grief. The team also meets monthly with nearby school districts such as Deer Creek, Yukon and Mustang to swap ideas. “We’ve gone from ‘Oh my goodness, what do we do?’ to ‘Now we have a plan,’” Ehlers said. El Reno’s crisis team even traveled to neighboring Okarche in August after its elementary school principal died in a roadside accident while assisting a motorist. Team members shared elements of their plan with the district and provided support for emotionally worn staff and students. Two years ago, Norman Public Schools revised its crisis plan to include specific, systematic procedures for suicide prevention, intervention and postvention. Its prevention plan has an education component that teaches students to recognize intense feelings or depressive behaviors and reminds them they can turn to school personnel to get help for themselves or their friends. Counselors are available to reach out to the family and develop a safety plan for the student at school. Sometimes parents are already aware their child’s behavior has changed: They may be spending more time alone, their grades may be slipping, or they may be giving away personal items or no longer opening up. Effective prevention is a hard area to measure, but the district has received positive feedback for its in-depth suicide prevention plan. “We’ve had parents be extremely appreciative of the support and awareness of their child’s current emotional state. In some situations, parents have expressed, ‘I think this probably saved my child’s life because we didn’t realize it was this serious,’” Heatly said. In the event of a student death, it is normal for classmates to respond with shock, guilt or anger. Such events can also trigger feelings from a previous traumatic incident. The crisis team trainings are designed to help schools act swiftly following a crisis and learn the social and emotional response needed to maintain a structured environment where students feel safe and cared for. “When a student is suffering from trauma, part of his or her brain just shuts down. It’s really hard to focus or be interested in assignments. You find students disengaging,” said Heatly, who cited declining grades, absenteeism, lethargy or lack of participation in usual activities as problem signs. Sutherlin said schools will collaborate with each another at the crisis team trainings and learn to identify individual risks that come with their location, which might include fault lines, flood plains and railroad crossings. 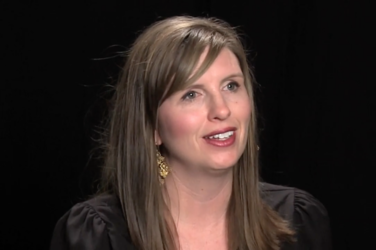 In a video to participants, Kristin Atchley will share her experiences as counselor at Plaza Towers Elementary in Moore during the May 20, 2013, tornadoes. Seven children died at the school, and the school building was demolished by the storms. She described a car tossed into the hallway where the Pre-K students had taken shelter, trying to track the students who were put into ambulances, taking note of the parents who still hadn’t found their children in the chaos and working with emergency personnel. “They kept saying, ‘How many more kids do we need to find?’ We didn’t know because kids just ran from the building, they ran to their parents, and we couldn’t keep track. There wasn’t a roster that you carried with you because everything was ripped out of your hands,” said Atchley, who said there was no handbook on how to respond. Since the tornado, Moore has passed bonds to build tornado shelters at every one of its school sites. Atchley said that when schools are prepared and teachers and counselors are aware of what they can be in control of during a crisis, like having backpacks of care items ready, it will decrease anxiety and allow them to focus on guiding students safely through the event. Lisa Parsons, who is in her 16th year as counselor at Chisholm High School, counted the crisis team training as one of the most valuable in-services of her career. Meanwhile, Harrah sent nine staff members to one of the Oklahoma City trainings. Elementary counselor Susie Matthews said she was looking forward to creating a crisis plan for her school. To register for the crisis team trainings, click here. To see the OSDE video about Plaza Towers, click here and here. PHOTOS: Participants to OSDE’s crisis team trainings receive workbooks and training guides to help them formulate individualized crisis plans for their schools. More than 900 educators from 200 districts have registered for the one-day trainings. 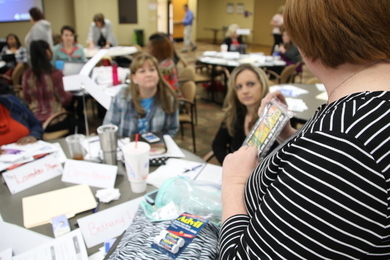 Michelle Sutherlin, OSDE’s director of prevention services, shows a care pack to training attendees that can be assembled with necessities in case of an emergency at school. Hands-free, ready-made kits like the backpack can be valuable during extreme emergencies like tornadoes. Kristin Atchley shares her experiences as the counselor at Plaza Towers Elementary in Moore during the May 20, 2013, tornadoes, which claimed the lives of seven children.